For the first time in 4 years, the number of people experiencing homelessness in Los Angeles decreased. The 2018 Homeless Point-In-Time Count numbers are out, and they bring hope. The count provides key data that guides our efforts to end homelessness, and shows that our strategic efforts have begun to pay off. More than 16,519 people who were experiencing homelessness moved into homes last year, more than any other year. ...and we see the results of those forces on our streets. More than 9,000 new people ended up on the street last year for the first time, a 16% increase over the year before. 46% of unsheltered people experiencing homelessness for the first time reported it was due to a loss of employment or other financial reasons. 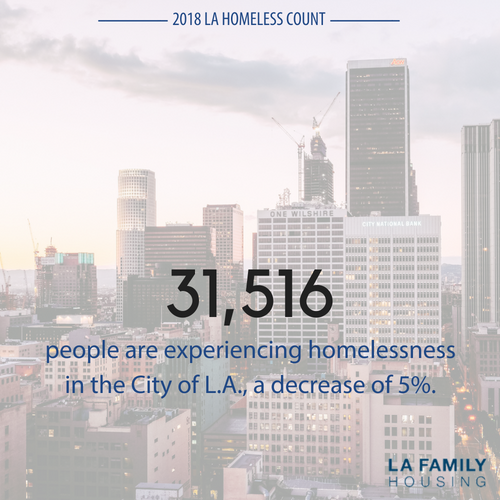 The data show a 5% increase from 2017 in the number of cars, recreational vehicles, tents, and makeshift shelters—which is a 32% increase since the 2016 Homeless Count. This may account for the widespread perception that homelessness is more visible than ever, despite the decrease in the number of people experiencing homelessness. 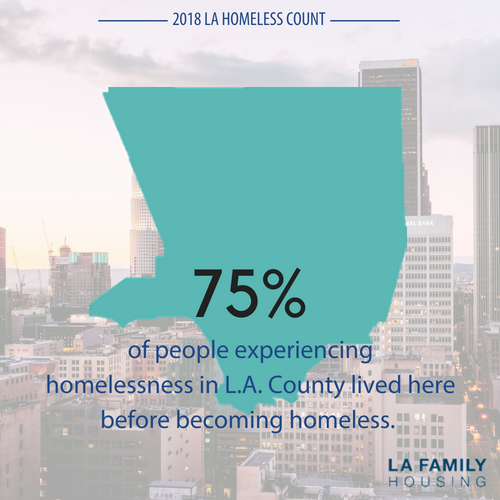 The Homeless Count helps us understand the demographic characteristics of people experiencing homelessness so we can target resources and improve services. 67% of people experiencing homelessness identify as male, 31% identify as female, 2% identify as transgender, and 0.3% identify as gender non-conforming. 80% are adults, 14% are families with children, and 6% are youth. 75% lived in L.A. County before becoming homeless. 65% reported having lived in L.A. County for 20 years or more. More than 3,000 people -- 6% of the homeless population -- became homeless due to fleeing domestic or intimate partner violence. 1 in 4 self-report experiencing serious mental illness. 1 in 8 self-report a substance abuse disorder. We are working together across the city and county at unprecedented levels of collaboration and investment, and our plans are starting to show results. We are improving efficiency and streamlining administrative processes to move people into homes faster, but there is still a lot of work to do. Many of the economic forces that drive people out of their homes can be positively impacted through advocacy. Support policies to increase the construction and preservation of affordable housing. Support state and federal partners in devoting more resources for new affordable housing development and homeless services. You can view the full report from the Los Angeles Homeless Services Authority here. join with us to help make a difference.